If you are planning a visit to Savannah, Georgia anytime soon, WELCOME! Even after living here for years, our family falls in love with this city more and more each day. Sometimes traveling can wreck your diet. There are certainly lots of places to indulge in your decadent side when it comes to food in our fair city. But Savannah is also full of healthy choices. 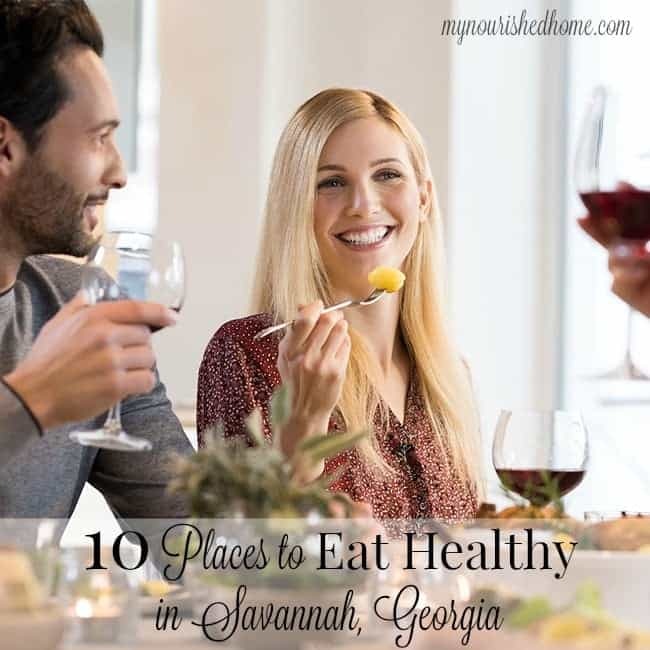 If you are looking for the insider’s guide to eating healthy in Savannah, Georgia, we’ve got you covered! So put your walking shoes on, dress for the hot weather, prepare to see all the historic sites – and rest assured that a healthy meal will be waiting for you when you get hungry! We love the Sentient Bean’s organic, fair trade, and homemade food – and don’t forget the fabulous coffee. They have drinks, art, and entertainment such as open mic nights, belly dancing, and more. Did I mention the coffee?! This is a real local’s hangout but you will love the come-one, come-all, come-as-you-are vibe. Grab a coffee or a beer and peek out back to see if the little patio has seating. 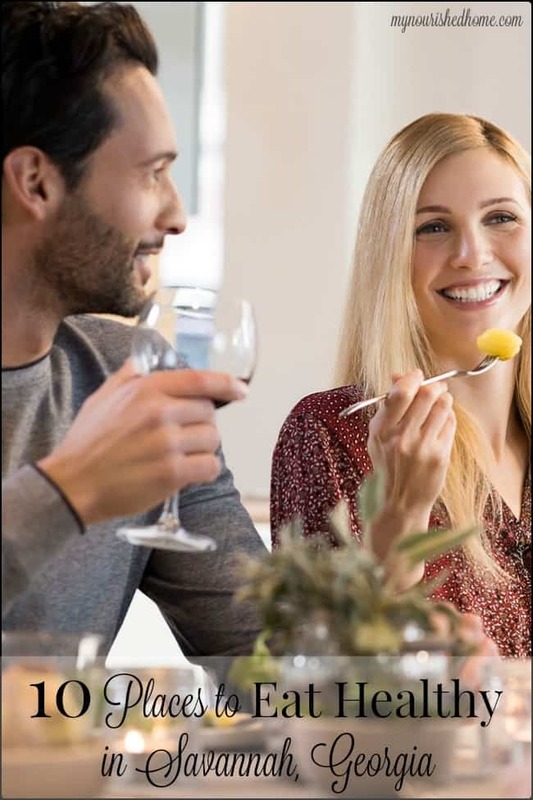 While we are total omnivores and love eating here, this is also a perfect spot if you have special dietary requirements like gluten-free, vegan, or dairy-free. Yes, I know it sounds corny but they have the best yogurt parfaits – I think it is the homemade granola. Grab sandwiches and a smoothie for your picnic at Forsyth Park. Stop by the Butterhead Greens Cafe for fresh food, all the time. They serve breakfast, lunch, and dinner – and are closed on Sundays. While Butterhead Greens has many great options, I do love their coffee drink menu so don’t pass that up if you visit. Voted “Best Wait Staff” in Savannah, the Green Truck Pub is one of those places you’ve gotta bring out-of-towners to when they visit. They always impress, with their Farm to Table burgers, sandwiches, soups, and salads. Their Veggie Burger is super tasty, too. Appetizers, entrees, and sandwiches… oh my! Zunzi’s has many options to choose from, including some vegetarian items on their menu. Be sure to try an iced tea! Zunzi’s is closed on Sunday. Every Saturday morning from 9AM until 1PM, your entire family can enjoy the sights, sounds, oh… and tastes, of Forsyth Farmer’s Market! There are many benefits of buying fresh, local food, with the delicious taste being one of our favorites. Shopping local means you know where your food is coming from, how it’s being sourced, and you’re supporting local farmers. Vendors change from time to time, so be sure to look at the vendor list and map out your plan of attack before heading to the Market! Go see Joseph Field’s Farms! First booth on the left when you head into the market after getting coffee at The Sentient Bean. Another local food stop on our list, Cotton and Rye is most definitely deserving of their nearly-5 stars on Yelp. They make their breads from scratch, and their motto is “We will always strive to make our guests deliriously happy”, which is exactly what they do. Cotton and Rye is closed on Sundays. If you’re looking for yet another local food joint in Savannah, Pacci’s has you covered. This soulful, sophisticated Italian Kitchen is open seven days a week, and serves breakfast, lunch, and dinner. Don’t forget brunch, they have that, too! Stopping by the Kayak Kafe is always a treat. Kayak Kafe is locally-owned and has two locations. Their food is fresh, and they offer vegetarian options. Locally sourced shrimp, antibiotic-free meat, and organic, natural foods are served at Kayak, for your dining pleasure! Open seven days a week until 3PM, Goose Feathers Cafe serves food that’s just plain good. Looking for a tasty breakfast or quick lunch? You know where to go. Delivery is offered from 9AM until 2PM, Monday through Friday. With all kinds of awesome options on this list, it’s going to be tough to decide where to go first!